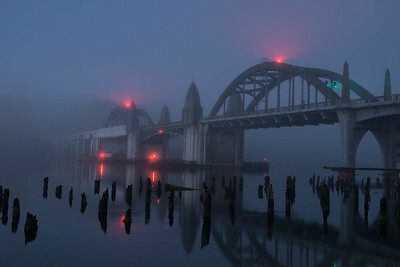 An eery morning by the gothic Siuslaw River Bridge in early morning fog surrounded by pilings. Florence is a beautiful town along the Oregon, Coast. If you get up early enough you can capture the eeriness of the world around. 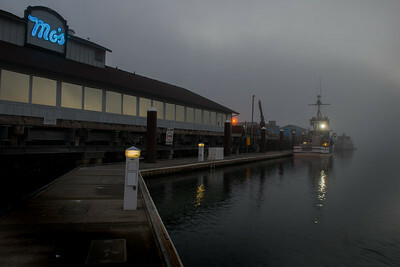 Getting photos in between the raindrops in Newport, Oregon. 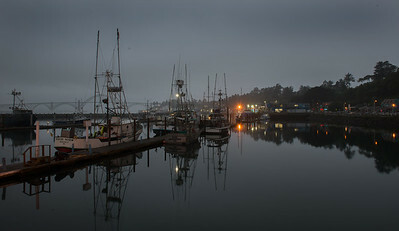 It was wonderful to spend time at a working fishing coast town. 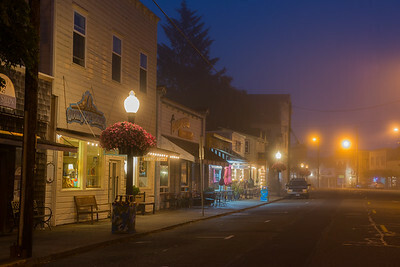 Newport, Oregon Fishing Village before sunrise. No sunrise came. After I took this photo it started to rain . 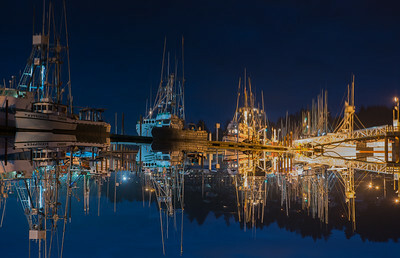 Early morning as the fishing boats get ready to head out on the water. 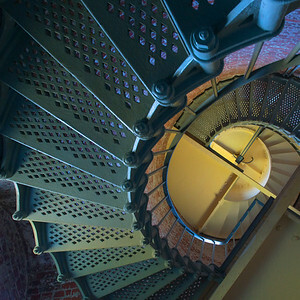 Inside the Cape Blanco Lighthouse in Oregon to take photos of the spiral staircase. The colors ad the bricks added to the texture and ambiance of the small space. 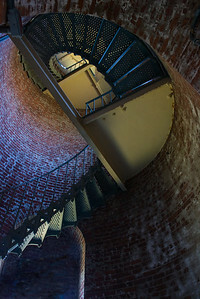 Circular Stairwell in a lighthouse. Cape Blanco has an attendant to make sure no one touches the bricks. Who knew? 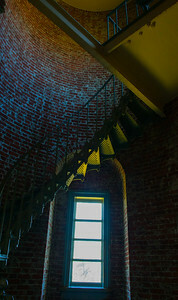 Cape Blanco Lighthouse stairwell.. 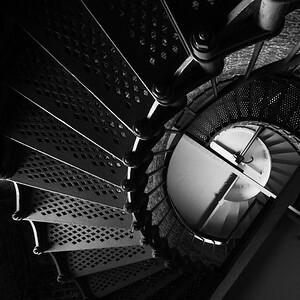 Lying on the floor to capture the circular stair. Take a deep breath, let it out and keep shooting to get a clear shot. 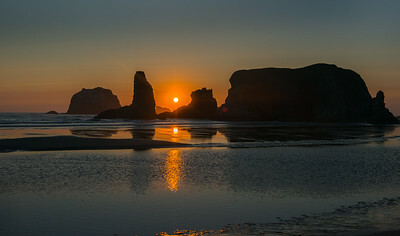 Sunset Over Bandon Sea Stacks. 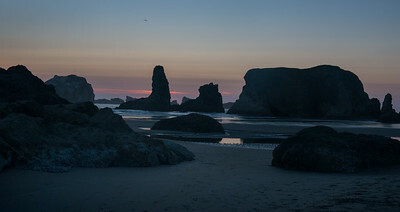 Last night in Bandon, Oregon until the sun was gone. Waiting and watching the sun as it sets between the sea stacks. 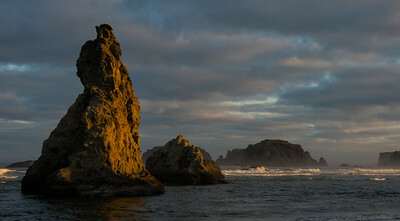 Sea Stack Panarama, Bandon Beach Oregon. 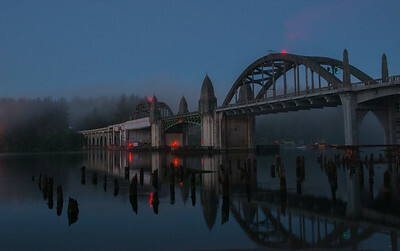 Up at 4AM to see the world with a foggy, eery feel before the sun comes up and brings the world to life. 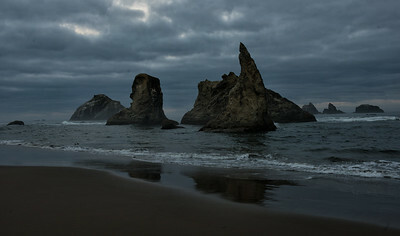 In the quiet of the morning, before the coffee gets brewed in Florence, Oregon on the coast. Fog has settled in. Waiting on the sun to break through. 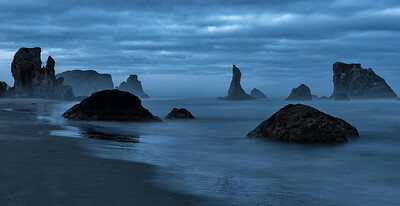 Early morning gray sky over the water in Oregon coast. Sunset, and the end of a beautiful week on the Oregon coast. 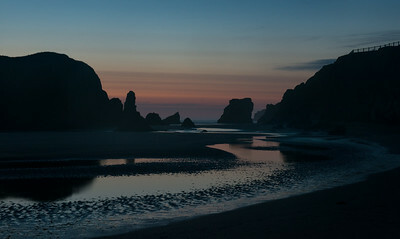 "The end of a beautiful day"
The end of a day, the end of a wonderful week of photographing the Oregon coast. 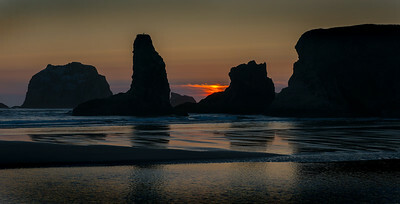 Sea Stacks light up in Bandon, Oregon as the sun sets.